This post was largely written for the national audience at Hot Air’s Greenroom, where it is posted. My radio colleagues Ed Morrissey (with the A-squad Hot Air) and King Banaian (of SCSU Scholars, also found in the Green Room) will post on occasion about politics in Minnesota, where the three of us live, work, blog and do a bit of talk radio. And when we do write about Minnesota – especially its freaks of electoral fate, like Al Franken and Jesse Ventura – we get a long string of similar comments; “What do you expect from Minnesota?”, “That’s those crazy Minnesotans” and, when the Emmer/Dayton gubernatorial race comes up, “I don’t have a whole lot of hope for Minnesota”. We were the only state that never voted for Reagan – although to be fair, the state voted for Walter Mondale, a native son, in 1984 (a year before I moved here). If that’s what you feel, you’re wrong, and you need to re-think things. And I’m going to try to start that rethinking right now. Don’t get me wrong. Minnesota is a strange place, in a lot of ways. It’s an adopted home for all three of us; Ed’s from LA, King was born in New Hampshire and arrived in Minnesota via California among a few other places, and I grew up in North Dakota (and moved here 25 years ago as of this coming Wednesday). And I think we’ve all scratched our heads, agog, at some of the political weirdness this state has spawned. Everyone recalls the bizarre 2008 election, where former comedian and failed talk show host Al Franken beat incumbent Norm Coleman in a race that Coleman led by 200 votes on election night – and Franken won by 300 after eight months of recounts and legal maneuvering, exposing many flaws in Minnesota’s electoral system (like the law allowing people to vote without showing ID, but being vouched for by another registered voter). More infamously, Jesse “The Body” Ventura, running for Minnesota’s “Independence” party, which was essentially a vanity offshoot of Ross Perot’s “Reform” Party, won the 1998 gubernatorial election, beating Hubert Humphrey’s son Skip and…Norm Coleman. Minnesota has had plenty of electoral weirdness in the past; the Democratic/Farmer/Labor Party (the “DFL”, as we call Democrats here) had long ties to the far, far left; Stalinists were a powerful force in the party until Hubert H. Humphrey managed to purge them in the mid-forties; former Eighth District congressman John Bernard, of the antecedent, radical-left “Farmer/Labor” Party, cast the sole vote in 1938 against embargoing arms to the Stalinist side in the Spanish Civil War. Gus Hall, long-time head of the Communist Party USA and one-time perennial presidential candidate, was a Minnesota native, who cut his teeth as a radical organizing the mines of Northern Minnesota. Culture: Minnesota’s dominant culture in its formative years was immigrants from rural Scandinavia, especially Norway and Sweden. Both nations have long histories of being poor, and developed communitarian traditions to cope with the grinding poverty of life in the Norwegian mountains, the endless woods of Sweden, and the motti of Finland. These communitarian traditions were easy to co-opt for political ends. Agriculture – Farmers in Minnesota and elsewhere tend to be conservatives, although like farmers in neighboring Iowa, Wisconsin and the Dakotas, they’ve had a willingness to vote for Democrats who bring home the pork. Mining – Iron mining was huge business on the “Iron Range”, the taconite-rich area of northern Minnesota, throughout the 20th century. Miners – largely immigrants from Finland, Germany and eastern Europe – were easy pickings for labor organizers, and formed the hotbed for the radical, Communist-affiliated “Farmer Labor” party that eventually joined with the Democrats. The University System – Minnesota has two parallel university systems. These systems run parallel lobbying efforts in the Legislature. Lest you wondered, Minnesota faculties are no less far-left than academics in any other states. The Media – Minnesota’s newspaper of record, the Star/Tribune, is second to none nationwide in the flagrancy of its editorial board’s pro-DFL bias. It’s other mainstream media – the Big Three network affiliates, and the programming (albeit not necessarily the News) divisions of Minnesota Public Radio, the nation’s largest public-media network and a pseudo-national network in its own right, aren’t far behind. Business – Minnesota’s key businesses – those that survive today (Target, 3M, Honeywell, Best Buy) and those that have gone by the wayside (Control Data, Cray, Daytons, Northwest Airlines) had a long tradition of communitarian philanthropy. The DFL and their allied network of non-profits was happy to harness this to their ends. Legend: Minnesota was a sleeping economic giant for decades before the late sixties – when the confluence of resources, an educated populace, infrastructure (the Mississippi, the Great Lakes and the rail system) and booming markets launched Minnesota into prosperity. The media, Minnesota’s academy and the big-government interests assigned the success to a series of government programs that essentially redistributed tax wealth from the Twin Cities to the poorer outstate regions, christened it the “Minnesota Miracle”, and launched a myth that survives to this day. Events: Minnesota was 20-odd years late to the Reagan Revolution. The Minnesota GOP closely mirrored the national Republican Party throughout the fifties and sixties, the years of the Rockefeler/Eisenhower axis of very, very moderate, big-government Republicanism. The aftermath of Watergate and the rise of the social conservatives in the national party in the mid-seventies caused then-ascendant “progressive” wing of the MNGOP to essentially secede from the national party, rebranding itself the “Independent Republican Party“, which lasted for twenty years and the governorships of very liberal Republicans Wendell Anderson and Arne Carlson (and Al Quie’s single term, during which his mid-stagflation budget-cutting enraged the DFL establishment enough to get him tossed from office). The Republican grassroots didn’t actually get on board with the rebirth of conservatism until the mid-nineties. So Minnesota’s got some dodgy history when it comes to politics. But there are also grounds for hope – maybe immense hope. Like most “purple” states, Minnesota is really very sharply divided between conservative and “progressive” voting. Link courtesy Minn-Donkey, a leftyblog that doesn't completely insult ones' intelligence. The inner cities of Minneapolis and Saint Paul – the 5th and 4th Districts, respectively – and the “Arrowhead”, the northeast part of the state, DFL-dominated Duluth and the Iron Range – are traditional DFL strongholds. Demographics: The deepest-red districts – the southern and western suburbs of the Twin Cities – are where most of the growth is happening. Most business and population growth is in these districts, which include the Second CD (John Kline, a staunch conservative who will win his race by at least 30 points this November), the Third (Erik Paulsen, who is growing more conservative in office as his district, once considered “purple”, drifts rightward) and the Sixth (Michele Bachmann, of whom more in a bit). The Wave: It’s hard to tell, but it seems big things are happening in the hinterland. First, the First District – the traditionally-Republican, ag-dominated southern tier of counties, represented by second-term DFLer Tim Walz – is considered in play; Walz supported Obamacare, which will gut one of the region’s major employers, the world-famous Mayo Clinic, which is already diversifying its operations outside the state and US to hedge against the worst. Better yet? The Seventh District – the tier of counties along the western border, represented for a generation by blue-dog Colin Peterson – are restless. Lee Byberg, a Norwegian immigrant and bio-tech entrepreneur, has raised more money in this campaign than all of Peterson’s opponents together in recent memory. The ag-dependent district is not thrilled about Obamacare, and there is speculation that those red counties could be one major tipping point away from sending a Republican to Washington. Best of all? That tipping point may be brewing up in mining country. Last week, news broke that Chip Cravaack, an Annapolis grad and retired Navy chopper pilot, was within three points of 18-term Representative Jim Oberstar in an internal poll in the Eighth District, the “Arrowhead”, which has sent DFLers to Washington since 1947. Oberstar hasn’t had less than a 29 point margin of victory in a generation. If it’s even close in the Eighth, anything can happen. The voters in the Eighth are union voters, largely, and have been voting DFL for several generations – but they are largely pro-life, as was Oberstar, until he threw his lot in with the Administration on flipping the Stupak coalition toward Obamacare last year. Worse? Cap and Trade will shred the mining industry, which uses immense amounts of energy whose price spike after passage will put many mines out of business. The Loyal Opposition: Conservatives in Minnesota are a close-knit political Band of Brothers; we’ve had to fight two wars in the past fifteen years. We had to win over our party before we could even take on the DFL. And the veterans of those struggles are tough as nails, immune to abuse, and so clear on principle that debates against DFL opponents usually resemble turkey shoots. 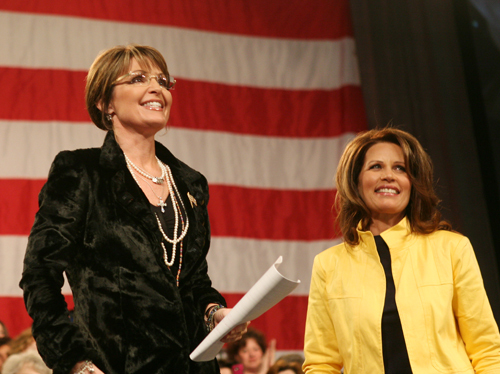 The rest of the nation knows Michele Bachmann as the vice-queen of the Tea Party, at Sarah Palin’s side. But Bachmann didn’t start in Congress. She started out fighting the Stillwater (MN) school board, a Twin Cities exurb clogged with liberals tired of the DFL’s failed cities, but unable to leave the failed policies behind. She had to battle her own district’s IR legacy to get endorsed, first for State Senate (where she was a conservative lightning rod for six years) and then against a moderate-leaning establishment in the Sixth District in 2006, even before facing the DFL. Many Minnesota conservatives have similar stories; years spent fighting the “Independent Republican” establishment before even being able to take on the Democrats. This has created a grass-roots conservatism in Minnesota that has slowly insinuated conservative ideals and, eventually, policies into parts of Minnesota that would have been inconceivable a few decades ago. How do we know? The latest Rasmussen poll shows that while voter ID in Minnesota is very close between the GOP and DFL, that Tea Party sympathy is actually higher in Minnesota than the national average. Conservative Unity: Minnesota’s “craziness” was as much a symptom of the Minnesota GOP’s schizophrenia over the past forty years as it was to any liberal tradition. For several elections, Minnesota’s “moderates” duked it out with, and defeated, conservatives; in 1990, while the grass roots endorsed social conservative Alan Quist, Arne Carlson – a man more liberal on many issues than the DFL incumbent Rudy Perpich, including gun control and abortion – ran and won a primary challenge, and spent two terms as a free-spending, surplus-gobbling governor. Even Tim Pawlenty, who had a reputation as a pragmatist if not an outright moderate during his time as House Minority leader, had to tack hard to the right to fend off a challenge to get endorsed in 2002, against fiscalcon challenger Brian Sullivan, winning the nomination after promising “No New Taxes”. This years MNGOP convention was distinguished by the fact that the front-runners – House minority leader Marty Seifert and eventual nominee Tom Emmer – while impeccably conservative, had three challengers to their right. There was no “moderate” in the race (after Norm Coleman declared he wasn’t running). For the first time in recorded history, the Minnesota GOP is a unified conservative bloc (to the consternation of the regional media, which audibly slavers for a return of the old, “moderate”/liberal “IR”, basically liberals with better suits. So this is not your father’s Minnesota. This is not the same Minnesota that voted for Walter Mondale. This is a hungrier, less-prosperous Minnesota than the one that voted for Jesse Ventura in the cha-cha nineties, when the state was running multi-billion-dollar surpluses. This is not the Obama-crazy state that delivered Al Franken to Washington – and the conservative movement is not the naive bunch of trusting schlemiels that let the DFL bully its way through a recount process that was designed to manufacture votes for Franken and toss votes for Coleman. The wave of conservative, anti-Obama sentiment is washing up in Minnesota as well; there is evidence that the regional media has no idea how much so. For whatever reason (as discussed on the NARN shows on AM 1280 Saturday) and with Michael Barone at the Center of the American Experiment talk this past Tuesday, “Minnesota is different.” Whether it’s genetics, an isolated view of ‘liberalism’ or something else, in order for our great, conservative candidates to win, we simply have to work harder, dig deeper and make those voter ID phone calls. Yes, they can be a pain but we need to do them. Why? In 48 states, voters declare party affiliation at time of voter registration. They don’t have to spend $$$$ trying to find out who votes how. Any candidate can apply for the list of R or D or all voters and get it. We don’t have outside $$ funding id for us, we have to do it ourselves. Don’t write Minnesota off. This race is just getting interesting. This entry was posted in Campaign '10, Minnesota Politics, MN Congressional and tagged MN CD2, MN CD3, MN CD8 by Mitch Berg. Bookmark the permalink. 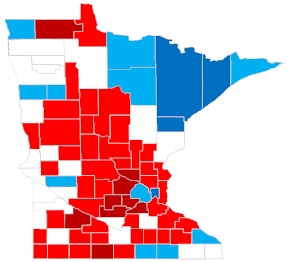 It would be nice if you had mentioned where you got the nice looking red/blue color coded map of Minnesota or at least put a link in. Sort of off topic I know, but didn’t Honeywell move it’s headquarters out of state years ago? Tony – it’s an oversight. I thought I had. I fixed it. Hope your server is up for the avalanche of traffic. Jim, it’s in New Jersey now. My wife could have transferred to Rhode Island, but that wasn’t a very good option at the time. Honeywell was bought by Allied Signal which is headquartered in New Jersey. The merged company took on the name Honeywell. Wendell Anderson was a DFLer. He resigned and had himself appointed to fill Mondale’s seat in the Senate by his lieutenant-governor, Rudy Perpich. Doh. That’s right. It’s way before my time as a Minnesotan. Blah. Mitch, the ’60s were way before your time, too. The state demographer and Census Bureau have facts that say otherwise. Minnesota’s educational attainment was slightly below the U.S. average before 1970. Significantly, so was per capita income. The 1980s were the first decade when we moved above average. That “series of government programs that essentially redistributed tax wealth” was largely to fund education. The Minnesota Miracle “myth” at least has something to back it up, unlike your grand summary here. It’s not often I catch posts when they’re three months old, CQ, but sometimes I get lucky. Wasn’t necessarily referring to aggregate test scores or degrees across an entire population, Charlie. There may have been fewer BAs in Bemidji, and fewer diplomas in Detroit Lakes, than the national average. But the Twin Cities had a pretty thriving little technocrat class. The lower-than-average income was already noted. And while your “myth”‘s “evidence” may indeed exist, it’s chicken and egg. Would Minnesota have grown without the government programs? We don’t know. I suggest it would have.